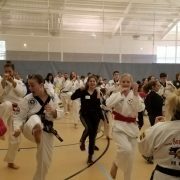 Asheville Sun Soo Martial Arts is thrilled to be a sponsor for our local National Girls and Women in Sports Day events this Saturday, February 16th, held on the campus of UNC Asheville! Created as a means of celebrating the achievements of women and girls in athletics, as well as provide exposure to different types of physical activity, National Girls and Women in Sports Day is celebrated in February every year. This year’s event is being coordinated by the Asheville Parks and Recreation department, and will be held at UNC Asheville. Asheville Sun Soo will be conducting 40 minute classes with 10 minute intervals in between. These start at 9:30am, 10:20am, and 11:10am, and are followed by an exciting demonstration beginning at noon. Clinics will be open to all participants in the events of the day! Asheville Sun Soo looks forward to treating event attendees to an inspirational example of what is possible with a martial arts practice! Students who wish to participate should arrive at the Student Recreation center no fewer than 20 minutes before the event they plan to attend. Please wear your white uniforms! With the exception of the Mighty Tigers/Mighty Lions class scheduled for 8am, Asheville Sun Soo will not be holding classes at our location in the River Ridge Market Place on Saturday, February 16th . Instead, all students wishing to attend class on Saturday can choose from among the clinic sessions and demonstration opportunity. Students are invited to come to one or more of these sessions. Class credit will be available – be sure to sign in upon arrival! As a school, Asheville Sun Soo Martial Arts is intentional about supporting healthy community events. We are particularly excited about supporting women and girls being involved in sports of all types. We are excited about being a part of this year’s event! If you are interested in having Asheville Sun Soo Martial Arts do a demonstration or class for your group or event, please contact Master Tony Morris at tkdtonymorris@gmail.com or by phone at 1-828-505-4309. We are pleased to have Grandmaster Barry Partridge as our guest Grandmaster Instructor for the very first testing event in our new space at the River Ridge Market Place, which will take place this weekend, February 8th and 9th, 2019. Grandmaster Partridge holds an 8th degree black belt in Tae Kwon Do and has been practicing for 45 years. He is a three-time former USTA heavyweight champion and has been a coach to several US Tae Kwon Do Olympians. Grandmaster Partridge is completely devoted to teaching and spreading Tae Kwon Do. He is a superb athlete, and a warm and charismatic person. Grandmaster Partridge is also a devoted father. He has a son, Dominique, who also practices and is currently a senior in high school, as well as a daughter, Sophie, who will be testing for her 1st Dan later this year. Master Morris and Grandmaster Partridge have much in common. They share two previous teachers and they both attended NC State University in Raleigh at the same time, in the 80s. Grandmaster Partridge played college football for NCSU. He was a Traditional Tae Kwon Do stylist up through 3rd degree and then transitioned to Olympic-style Tae Kwon Do, which he has practiced and taught professionally for over 20 years. Grandmaster Partridge is the Master instructor of two schools, both called United Taekwondo Academy – one of which is in Winston-Salem and the other of which is in Chapel Hill. He shares his teaching time between the two schools. He chooses to instruct martial arts for a living as he feels like it’s the way for him to make the greatest difference for people. Grandmaster Partridge loves teaching and loves teaching teachers – which is another thing he shares with Master Morris. He enjoys facilitating people’s discovery of their own resources to become more effective. As a practitioner – he loves staying physically fit and enjoys running in addition to Tae Kwon Do. Although he is very accomplished, he is very humble about these accomplishments. He believes that when people develop self defense skills, it actually creates a peaceful community because “when people are confident that they can take care of themselves, they are relaxed and comfortable and they don’t overreact – they are able to maintain peace.” Grandmaster Partridge has great respect and appreciation for other healing modalities beyond martial arts. We are excited to welcome such an accomplished and enthusiastic teacher, as well as an awesome human being, to our school for testing this weekend. 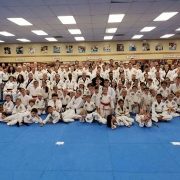 Grandmaster Partridge will be teaching our Masters Club Seminar, Saturday morning at 10 AM, covering sparring and in-close self defense techniques . Grandmaster Partridge is looking forward to seeing our students, stating that he loves our family-oriented community, and always feels motivated to infuse his own schools with some of our energy. Please give Grandmaster Partridge a warm welcome when you see him in the studio this weekend!